The 6-foot-4, 260-pounder was named NPSL Cascade Division Lineman of the Year last season as just a sophomore. They call him Big Fundamental because of his technique. He’s leaning toward football over baseball. He’s not so skinny anymore. Who is No. 1 in The Seattle Times' preseason state football rankings? 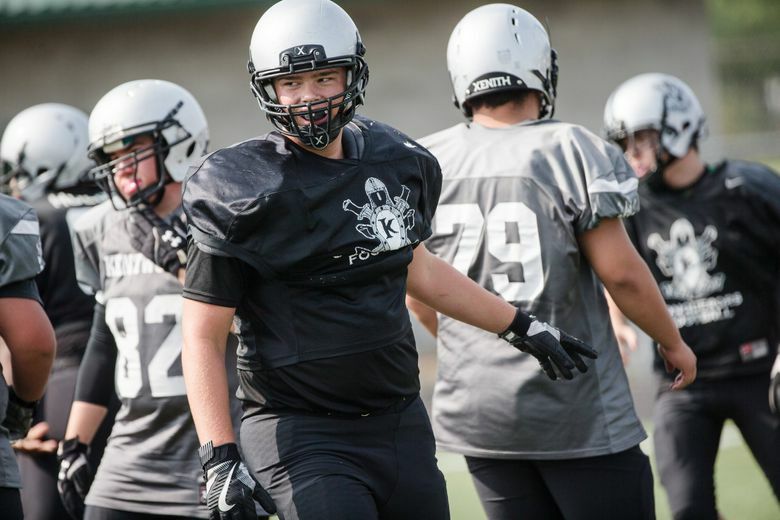 Hansen broke onto the NPSL football scene last fall as a tall, lanky – 6-foot-4, 240 pounds – sophomore at Kentwood and quickly impressed on both sides of the line, helping the Conquerors capture a share of the Cascade Division title. He graded out as the team’s top offensive lineman in seven of 10 games and did not give up a sack – a particularly noteworthy stat since Kentwood finished No. 2 in the NPSL in passing yards. Opposing coaches took notice: Hansen was a first-team, two-way selection in the all-division voting and was named Offensive Lineman of the Year. Tahoma coach Tony Davis is one of them. Oh yeah, there’s that. Hansen was just 15 years old all of last season. His 16th birthday came the day after Kentwood’s loss to Woodinville in the first round of the Class 4A state tournament. He made his varsity debut at age 14, a late-season call-up on the O-line from the freshman team. Coach Mike Bush liked what he saw. Hansen’s parents wouldn’t let him play football until seventh grade because in youth football his size would have meant playing against much older kids. Even in seventh grade, a coach wanted to move him up to the eighth-grade team – so the seventh-grade coach put him at quarterback to keep him. He had been hitting baseballs since age 4, playing first base and pitching, and that sport had long been No. 1 in his eyes. Football has closed the gap. Bush definitely believes Hansen has a big future in football. “We look at him as a Division I football player,” he said. His No. 1 asset is his technique. Teammate Victor Juarez, who has played with Hansen since middle school, said Hansen works hard at everything he does and is a relentless blocker. “He’s very hard to get off of,” Juarez said. And the skinny is that Hansen will make that even more difficult this season. Kennedy Catholic: Ultra-talented team should challenge for the Mountain title and maybe more, but is still young overall and could be a year away from making deep playoff run. Enumclaw: The Hornets have most of their starters back from the team that shared a division crown last year – including a great quarterback-receiver duo. Beamer: With experience on both sides of the football, coach Darren McKay says this could be the Titans’ best team since he took over in 2012. Returning Star Times defender has multiple Division I offers due largely to his knack for getting to the football and making big plays. 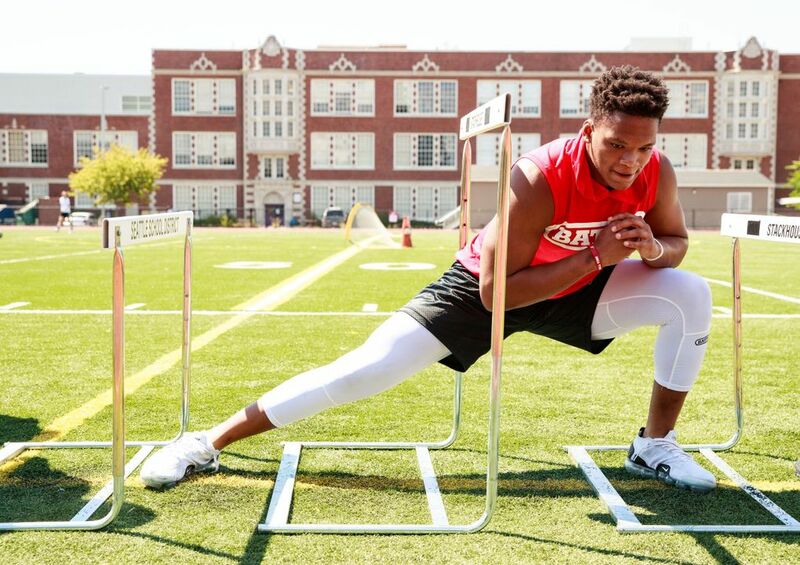 Impressive 2017 debut led to his honor as MaxPreps National Freshman of the Year, and he’s only expected to get better and better. Aggressive, physical defender with great football instincts. Was among the NPSL tackle leaders as a junior to earn all-league, first-team honors. The Hornets’ go-to guy in clutch situations, Eilertson’s work ethic is second to none. The precise route-runner earned first-team all-league honors as a junior. At 6 foot 5, 340 pounds, Matila more than passes the eye test and has excellent feet and hands for his size. A four-year varsity player who should draw plenty of attention this season.